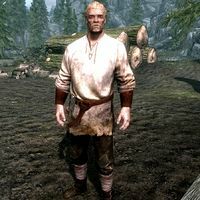 Hod is a Nord lumberjack in Riverwood, operating the wood mill there. He lives on the southeast edge of town and works his small farm and the mill with his wife, Gerdur. They have a son named Frodnar. He also seems to be a little flirty, saying: "You met Camilla yet? Wouldn't mind getting my hands on those trunks. He he he he." If you are a female, he will also remark: "Now you, lass... You've got some beautiful trunks yourself... Hmm?" He will buy firewood for 5 gold per piece, and will also sell lumberHF if Hearthfire is installed. If his disposition is raised high enough, he will also allow you to cut your own lumber for free. Hod wears a set of miner's clothes and a pair of boots. He carries a key to his house as well as common loot and gold. He wields an iron dagger and an iron war axe. Gerdur: "Can the sawmill handle those logs? They look a might [sic] big." Hod: "Ay, it can. Wouldn't want them any bigger though." Hod: "Gettin' dull. We'll need a new one soon." Gerdur: "I'll talk to Alvor about getting us a new one." In the evening, Hod will go to the Sleeping Giant Inn. Depending on who is present with him in the inn, he may have conversations with three different people. Alvor: "I got a new order in for shields. I'm gonna need some hardwood planks. None of that soft pine this time." Hod: "Ay, we can get that for ya. We just finished the timber for those catapults." Alvor: "War may be good for business, but it's hard on families." Hod: "A hard truth, that is. Let's drink to the fallen ones." Hod doesn't go to work each day. If he is not at the mill at 8 am, and you break into his house, you should find him standing inside. He will greet you or tell you to get out, and when you leave, he will follow you outside and may walk to the mill and start work. However, he may stand by his house for a few hours instead. If Hod is not at the mill during business hours, use the lumber pile, then the lever, then wait one hour. He shows up during this time if Hearthfire is installed because Hod must be present when using his mill. The mill that Hod works on is sometimes put into an infinite usage cycle, rendering the entire mill unusable by you for the remainder of the game save. This may be related to the fact that Hod has trouble showing up to work. ? Hod may stand in his front yard and perform his lumber mill working motions. ? This page was last modified on 26 January 2014, at 06:30.